Oxygen leaks from a tanker truck after an explosion at the Kaiser Permanente medical office. 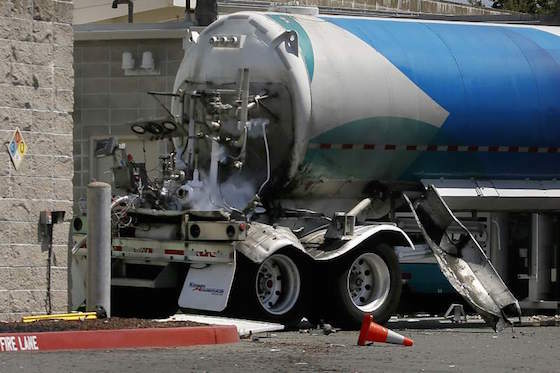 An explosion of a tanker truck outside a Kaiser Permanente medical building in Santa Rosa, CA, remains under investigation, officials said. The explosion, which occurred Wednesday as the truck was delivering liquid oxygen to a Kaiser office on Old Redwood Highway in north Santa Rosa, CA, is under review by the state Division of Occupational Safety and Health (Cal/OSHA). The agency has up to six months to issue citations for any violations of workplace safety and health regulations in the blast, which caused significant injuries to the driver and forced the evacuation of two medical offices located about a mile north of the main Kaiser hospital site in Santa Rosa. Highway 101 and Old Redwood Highway also were closed for about two hours. Santa Rosa firefighters and police investigators are reviewing the incident as well. “All three agencies are playing an equally important role as we sort through the evidence in this case and find out exactly what occurred in this investigation,” said Santa Rosa police Lt. John Cregan. Police investigators won’t be finished with their work for at least a few weeks, Cregan said. The exact cause of Wednesday’s explosion remains unclear, but authorities have said it occurred as the driver was trying to deliver the oxygen to an on-site tank. The driver, a 36-year-old Sacramento man whose name hasn’t been released, suffered significant injuries and remained hospitalized Thursday in stable condition, Cregan said. Equipment on the rear end of the Kaiser building where the explosion happened sustained minor damage, and debris also damaged numerous cars nearby, Cregan said.